Alexandria, VA – Visit Alexandria is inviting fans of the hit PBS drama series MERCY STREET to enter for a chance to win an exclusive MERCY STREET experience, including a tour of the set where PBS’ MERCY STREET Season Two is currently being filmed in the Richmond, Virginia area and a tour of historic Old Town Alexandria, Virginia to experience the real sites and stories that inspired the series. The Visit Alexandria Sweepstakes – MERCY STREET Set Visit and Guided Alexandria Tour kicks off on April 27, 2016 at 11 a.m. E.T. and closes on May 13, 2016 at 10 p.m. E. T.
To learn more about the Visit Alexandria MERCY STREET Inspired Sweepstakes, please go to VisitAlexandriaVA.com/MercySweep for official rules and complete details on how to enter. The ensemble cast for Season Two of MERCY STREET includes Mary Elizabeth Winstead (10 Cloverfield Lane, “The Returned,” The Spectacular Now) as nurse Mary Phinney, Josh Radnor (“How I Met Your Mother,” Liberal Arts, Broadway’s Disgraced) as Dr. Jedediah Foster, Gary Cole (“Veep,” “The Good Wife,” “Entourage”) as James Green, Sr., Hannah James as Emma Green, Brad Koed Jr. as James Green, Jr., Norbert Leo Butz (“Bloodline”) as Dr. Byron Hale, Tara Summers (“You’re the Worst,” “Rake,” “Boston Legal”) as nurse Anne Hastings, McKinley Belcher III (“Show Me a Hero,” “Chicago PD”) as Samuel Diggs, Jack Falahee (“How to Get Away With Murder”) as Frank Stringfellow, AnnaSophia Robb (“The Carrie Diaries,” The Way, Way Back, Bridge to Terabithia) as Alice Green, Donna Murphy (“Resurrection,” “Hindsight,” Broadway’s Passion and The King and I) as Jane Green, L. Scott Caldwell (“Southland,” “Lost,” “ER,” The Fugitive) as Belinda, Suzanne Bertish (“Rome”) as Hospital Matron Brannan and Luke Macfarlane (“Brothers and Sisters,” “Over There”) as Chaplain Hopkins. PBS’ announced on April 26, 2016 new cast members for Season 2 including Brían F. O’Byrne (“Mildred Pierce,” “Aquarius”) as Allan Pinkerton, head of the Union Intelligence Service, Patina Miller (Pippin, “Madam Secretary,” The Hunger Games: Mockingjay – Parts 1 & 2) as Charlotte Jenkins, a black Northern abolitionist and former slave who escaped to freedom years before through the Underground Railroad and Bryce Pinkham (A Gentleman’s Guide to Love and Murder, The Heidi Chronicles) as Maj. Clayton McBurney III, the new hospital chief. 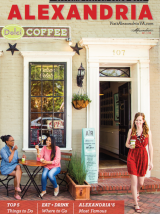 Visit Alexandria markets Alexandria, Virginia as an extraordinary destination for leisure and meetings, driving visitation through branding and high impact marketing that strengthens the city’s economy. Named a Top Romantic City, a Top Dog Friendly City, and with a dramatic history featured on the PBS series MERCY STREET, Alexandria is a nationally renowned waterfront destination just five miles from Washington, D.C. Old Town Alexandria is the Shop Small headquarters of the region, with dozens of independently owned boutiques and restaurants tucked in to 18th- and 19th-century architecture still intact from the city’s days as George Washington’s hometown. New restaurants ignite historic and off-the-beaten-path neighborhoods as the waterfront district emerges with new energy. Alexandria hums with a cosmopolitan feel and a walkable lifestyle—a welcoming weekend escape next to our nation’s capital. More information is available at VisitAlexandriaVA.com, on the blog at ExtraAlex.com, and by following Visit Alexandria on, Facebook, Twitter and Instagram. Find press information and story ideas at www.VisitAlexandriaVA.com/press.